Artist Rachel Tribble has always been inspired by peace and the concept that art can produce a feeling of serenity and a connection to the universe. So it was a natural fit for her to join forces with Michael Brooke, publisher of Concrete Wave magazine and pioneer of the Longboarding for Peace movement. In a recent exclusive interview, Rachel described the movement that started a little over a year ago. "Longboarding for Peace became involved with at-risk youth and started to teach them longboarding as a way of learning about balance in life and learning that you can overcome obstacles… [Michael has] worked in Israel with Palestinian and Israeli children bringing them together for a week at a time teaching them all to skateboard." She explained that they have also worked in Texas trading weapons for skateboards in an effort to curb violence there. Longboarding for Peace has a goal of building a global Peace Army of 50,000 people. Rachel noted that have already reached people in 30 or 40 countries. Longboarding for Peace's most recent project is in support of the Native American activist and member of the American Indian Movement (AIM), Leonard Peltier, who was imprisoned for the death of two FBI agents in the 1970s. Many, including Amnesty International, believe he was wrongly convicted and label him a political prisoner. Peace activists have been working for decades to have his sentence reversed. 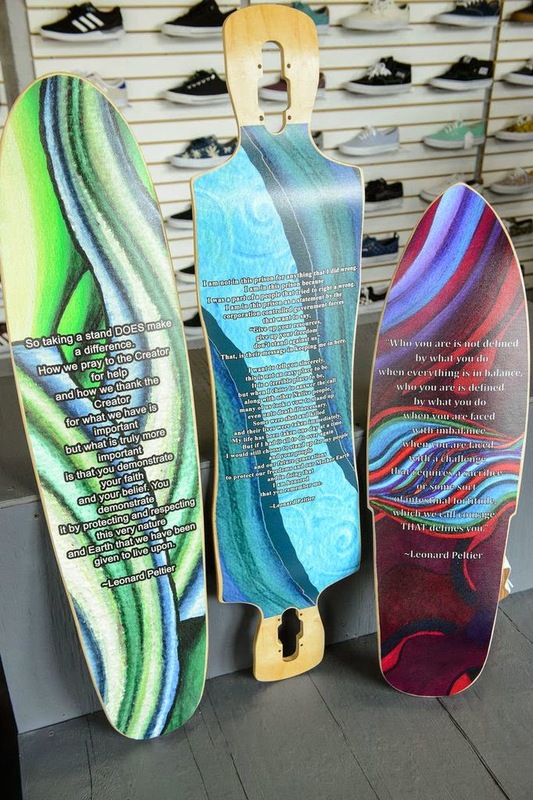 So when Rachel, a longtime advocate for the rights of Native Americans, found out that Michael was planning to start a project to benefit Peltier, she jumped at the chance to create artwork for three longboards. She explains, "He wanted to do a project that gave Leonard some public exposure to people that didn't know about the case. And he asked me to paint some longboards that would somehow define and quickly tell the story of Leonard, which was almost impossible to do." While Rachel was challenged initially by how to tell Peltier's tale through her art, she described her ultimate inspiration for the colorful, abstract, linear work she created. "One board has a feel of earth, one board has a feel of darkness and water and the other board is one of red fire… I did some research and I found a letter that Leonard himself wrote this year, 2014, from prison. It's a beautiful letter of thoughts on peace and what it's like to be in the situation that he's in. I took excerpts from the letter that were very fitting for the story and I used Leonard's own voice and his own words to tell his own story and his own statements." Rachel's one-of-a-kind boards will be auctioned off on eBay with the proceeds going to the Leonard Peltier Defense Fund. She stated, "Longboarding for Peace is a movement I really believe in. It's longboarders and skateboarders and anybody with a good heart and a desire to see peace in the world. It's not a non-profit, it's more of a pay it forward. So essentially we're a network of people who know people who know someone… Nobody's making any money off of it, it just people trying to help other people." Rachel has always been interested in examining the concept of peace through her artwork and has recently launched a new jewelry line that explores the themes further. While she has been working in this realm for a long time, the current state of the world makes her mission that much more timely. She said, "I'm pretty outspoken about how I feel about what's going on in the world right now, so I'm hoping that people of like minds respond." Her necklaces, mainly 28" in length, are handmade beads and glass on a weather froze chain. She remarked, "I want to call them Nebular, like a neutron star, a place where new hope and new life is born… to remind people that we all come from the one place, we all live in one earth, in one universe and one solar system and we should all be happy to be together here." Rachel shared that she gets her inspiration for all of her art from nature and meditation. "I live in a very quiet, rural area and I spend a lot of time in nature. And in those quiet moments I am often inspired by either something in a meditation or some depth of color that I may see in the morning. I get up just before the sun starts to rise and I go outside… I go into mediation as the sun pops the horizon. Everyday it's something different. It's amazing when you do that for a really long time, you start to realize that every single sunrise on this planet is different, every single one." She continued, "I am completely inspired by nature in those quiet moments… So when I paint I am trying to offer that to other people. When they look at my paintings, or they live with them like many people do, that they also can feel that connection to the universe and that connection to some serenity in their own lives. And my hope is that when people are around my work or they live with my work, that it will inspire them and they will be inspired to do something peaceful and help other people." Find out more about Rachel's art at her website RachelTribble.com and discover more about Longboarding for Peace at longboardingforpeace.org.